Representatives from 32 societies joined ABIM for the Spring 2017 Internal Medicine Summit in Philadelphia on April 7. This meeting was an opportunity for IM community leaders to come together and discuss cross-cutting issues important to Internal Medicine. I earnestly extend my gratitude to the society leadership and staff who attended the Summit to engage in thoughtful peer-to-peer discourse on these topics. ABIM leadership provided an update on its two-year maintenance pathway and the recently-announced enhancements to the exam experience, including an open-book option and Knowledge Check-In. Society representatives shared feedback on various aspects of the new program. This feedback was very helpful and suggested that many societies are optimistic about working with their memberships on the new model. We reiterated ABIM’s commitment to exploring and forming new partnerships with medical societies, including working with societies to produce a new kind of maintenance pathway. We are in very early exploration stages with the American College of Physicians (ACP), the American Society of Clinical Oncology (ASCO) and the American College of Cardiology (ACC), and our hope is that these initial talks will ultimately produce a template for working with other societies. A forward-looking discussion on quality improvement (QI) included representatives from the Accreditation Council for Continuing Medical Education, the Heart Rhythm Society, the Society of Hospital Medicine, and the American College of Rheumatology. The panel offered insight into principles-based criteria and included a patient perspective on potential ways to improve the quality of care delivered. The panel also discussed products from societies that have been successful in measuring quality improvement while fitting seamlessly into a health system’s workflow. Collectively, we discussed the role QI might play within a new health care landscape. The ways in which our organizations demonstrate value was both explicit and implicit in much of our conversations. Thinking about the roles we all play in helping make care better for patients — as well as ensuring there is a standard that they can count on — is a responsibility we all share. I appreciated the opportunity to think collectively about how we can maintain trust with the public and also help our colleagues maintain trust with their patients. The Spring 2017 Internal Medicine Summit was a seminal moment for ABIM and medical societies to reflect upon the challenges faced by the profession beyond just certification, and I thank the Summit’s more than 100 participants for actively participating in discussions. As a community, we must continue addressing the many challenges facing us in this new era of rapidly advancing technology and novel ways of communicating. If you missed us this spring, there are many other opportunities to share your ideas and feedback. Check the Upcoming Events page for fall meeting dates, here. 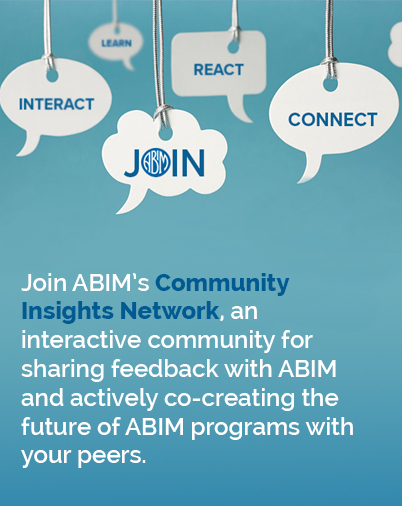 Join the ABIM Community Insights Network to be a part of an interactive community of your peers providing feedback to ABIM, here.